Olmert tells Jewish cities under fire to "get over it"
Fascinating. The Prime Minister of Israel expels the Jews from Gaza, gives it to the moslems as a good will gesture, gives those same moslems further gifts of money, weapons and ammunition, releases their terrorists from jail, watches them launch missiles from the very homes that used to be housed by the now homeless Jews he expelled, and when Jews in nearby cities are hit by these vile moslem attackers he says there is nothing that can be done and "them's the breaks". Ynet News - There is no immediate solution for the security problems which plague the residents of the Gaza vicinity communities, said Prime Minister Ehud Olmert Thursday, speaking at the Caesarea Forum, held by the Israel Democracy Institute in Haifa. "Life in Israel involves some risks," said Olmert, "But the risks we face here are far lesser than the ones threatening Jews around the world." "The terrorists wish to bring Israel to its knees by hurting innocent people …by kidnapping soldiers and praying on the fact that we care for our people by releasing pre-recorded tapes and dictated letters. As for fortifying the Gaza vicinity communities, Olmert doesn’t think that armoring every building is the answer. "This is just like the demands to solve the Qassam problem by wiping out entire communities in the Gaza Strip. We can't fortify ourselves senseless because there would never be an end to it. The risks the Jews face in Sderot is smaller than the dangers Jews around the rest of the world are facing? Funny, I don't recall any missiles being fired against the Jews ANYWHERE ELSE in the world. I don't recall seeing ten thousand Jews ethnically cleansed by any other army in the world ACCEPT the IDF. This is an abject lie from an abject traitor who abjectly needs to be executed for his inhumane crimes against the Jewish people. Ehud Olmert, perhaps the greatest and most destructive enemy to the Jewish people since Adolf Hitler, has announced he will release 250 convicted terrorists from jail as a "good will gesture" to the Palestinians. (IsraelNN.com) During his concluding speech at the Sharm El-Sheikh four-way conference on Monday, Prime Minister Ehud Olmert announced his decision to release 250 terrorists from Israeli prison. Candidates for release are those whose terrorist activities did not end in known deaths, and who were imprisoned for terror-related activities on behalf of Palestinian Authority Chairman Mahmoud Abbas's Fatah faction. The released individuals will have to sign a commitment to refrain from further terrorist activities after their release. Addressing his remarks to the PA Arabs, Prime Minister Olmert said that Israel is just as sensitive to the issue of its kidnapped soldiers as the residents of the PA are to the issue of their relatives serving time in Israeli jails as convicted terrorists. Olmert mentioned Gilad Shalit, held by Hamas, and called his Hamas captors "inhumane" and "emotional extortioners, an example of which we saw today" in the release of a recording of the captive IDF soldier. Prime Minister Olmert then announced, "Out of sensitivity to the matter of the prisoners, I decided today to bring before the government of Israel a decision according to which we will release 250 prisoners, members of Fatah, without blood on their hands, and who will commit themselves to refrain from further involvement in terrorism. I do this because I understand the importance of negotiations with the Palestinian Authority." How many times must I say this? Olmert needs to be taken from office and executed for his crimes against the Jewish people. He is rodef, an enemy pursuer seeking to kill innocent Jews, and must be treated as such. No mercy can be offered to this depraved traitor and heretic. As many of you already know, I have been loudly calling for Ehud Olmert to be removed from his position as Prime Minister, by force if necessary, and executed for his crimes of treason committed against the Jewish people. Many of you have criticized my position as "undemocratic" or "extreme", but the fact is I am right and you all should know better. Olmert is indeed an anti-Semitic traitor who is getting more dangerous to the survival of the Jews in Israel every day he remains in office. Now he's committing $590 million plus serious military equipment transfers to the Fatah terrorist organization, which was led by arch terrorist Yassir Arafat until his death from homosexually transmitted AIDS, and is now led by Holocaust denying terrorist chief Mahmoud Abbas. Ynet News - Prime Minister Ehud Olmert is not ruling out the possibility of transferring military equipment, including armored vehicles and bulletproof vests to the Palestinians, he said during a security consultation on Sunday. "Decisions on this matter will be made according to the recommendations of Major General Keith Dayton, who has been entrusted to build the Palestinian forces. Any recommendation by Dayton will be considered by the defense establishment. Only then will we decide," Olmert said. Olmert's position on the matter opposes the position of many of the cabinet's minister. Among the opposing minister are newly appointed Defense Minister Ehud Barak, Foreign Minister Tzipi Livni, two Yisrael Beitenu ministers and Shas ministers. National Infrastructure Minister Binyamin Ben-Eliezer said during the discussion, "Lessons should be learned from previous weapon transfers. All the weapons we have transferred to Fatah eventually made their way to Hamas and were turned against us." Ehud Olmert is not merely a delusional leftist who we can just laugh off. He is the Prime Minister of Israel who has proven he can and will do whatever it takes to help the moslems exterminate the Jews. He needs to go, and it should be done as soon as possible. A more despicable display I cannot recall. The heart of the Jewish people, the Jewish nation, the Jewish religion, twisted into a gay/lesbian /transgender freak show for the amusement of the PC world. Feh. If this is what having modern Israel is all about, celebrating sexual deviance and punishing Zionists, than the vermin can have it. Peace Now, a radical leftwing organization which the Olmert family originally helped found and still remain active in today, held a rally in Hebron today demanding that the few Jews still permitted to live in the City of the Patriarchs be forcibly expelled, making it the first time in over 3,000 years that Hebron would be 100% Judenrein. (IsraelNN.com) Peace Now, a left-wing group founded to bring about Israel's withdrawal from Lebanon, but expanded to work toward a withdrawal from all areas won by Israel in the 1967 Six Day War held a protest in Hevron earlier this month. The protest, in the heart of the tiny Jewish quarter of the city, featured large signs demanding the Jews be barred from living in the city of the Patriarchs. Only a matter of time before the Olmert family organization is successful in implementing the entire Peace Now agenda, so it will come as no surprise when Hebron is renamed Al-Fatah, and the ancient Jewish holy city is left in ruins just like Gush Katif. Very sad to see this. It makes me wonder what the modern Israel experiment was really all about in the first place if we are to make Judea and Samaria Judenrein as the price to pay for having the liberal City-State of Tel Aviv. Does it really matter if it's Fatah or Hamas in charge? After all, the one thing these vermin all share in common is the blind obsession with exterminating the Jews and making Israel into an Islamic State. A Qassam rocket fired from northern Gaza hit a factory in the She'ar Hanegev industrial zone near Sderot Monday evening. There were no casualties, but the rocket caused damage to the factory where hazardous chemicals were stored, and resulted in a gas leak of caustic soda. Police and fire-fighting forces were called to the scene, including teams specializing in handling dangerous materials. The fire-fighters located the site of the leak, sealed it and cleared the poisonous materials. Employees working the night shift were at the factory when the rocket hit. As I keep saying over and over again...Kahane was right. Katuysha rockets reigning down again in the north. Hamas taking over full control of Gaza to the west. Olmert promising to surrender Judea and Samaria to the Fatah terrorist organization in the east. Gay parades in the heart of Jerusalem. The placement of Shimon Peres as President of Israel. Lebanon War I loser Ehud Barak rises to Labor chief and new defense minister in Olmert's coalition. Olmert promising Holocaust denyer Mahmoud Abbas over $700 million in Jewish tax money to prop up the PLO in the West Bank. Olmert offering apologies and reparations to the moslems he says were forced to flee and become refugees because of Israel's tactics in the War of Independence back in 1947-48. Man, at this rate just make sure Olmert turns out the light when Israel closes up shop and gives the keys to the house over to the Arabs. 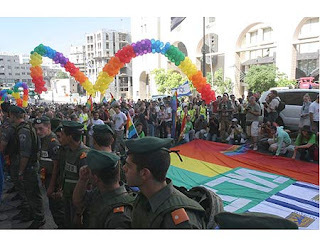 Gay Pride Parade approved by police for June 21st down the streets of Jerusalem. Shimon Peres made President of Israel. Moslem rocket slams school in Sderot. I have said in the past that Ehud Olmert must be removed as Prime Minister of Israel before he gives the entire country over to the vermin and sells all the Jews into the sea in the process. Now he's just making that case irrefutable. First, Ehud and Arik's wicked Gaza pogrom, then the tragedy at Amona, then the disastrous Hezbalon war, then the offer to give away half of Jerusalem and virtually all of Judea and Samaria, and now he just goes and throws the Golan Heights into the "good will gesture" bucket for good measure? JERUSALEM – Prime Minister Ehud Olmert has offered Syria the Golan Heights if the Damascus regime cuts its ties with Iran and ends support for Palestinian terror groups, the Israeli media reported today. The Golan Heights is strategic mountainous territory looking down on Israeli population centers twice used by Syria to launch wars against the Jewish state. Mainstream U.S. and Israeli military experts have long maintained Israel must retain the Golan to ensure against a ground invasion from Syria. Israel's leading newspaper Yediot Aharonot today quoted top Jerusalem officials stating Olmert used German and Turkish mediators to tell Syrian President Bashar Assad Israel would relinquish the territory in exchange for a peace agreement and Damascus' severing of ties with Iran and Palestinian terror groups. The report said Olmert's offer was approved by the Bush administration. Olmert's office has not denied the report. What does Judaism say about all this? Here's two excerpts from Mishneh Torah that are pretty clear. Hilchot Chovel Umazik, Chapter 8, Halachot 8-9: It is a mitzvah to kill a traitor wherever he is located This applies even in the present era when cases of capital punishment are not tried. It is permitted to kill him before he betrays someone...If, however, the traitor accomplished his objective and betrayed a Jew to the gentiles, it is forbidden to kill him unless we presume that he will betray others. And Rabbi Meir Kahane? Does he have an opinion of the Jewish traitor? You bet he does. The briefest of hints, but a chilling one: that in the end of days, Judah, Jews, will join the gentile enemy in war against Jerusalem. And behold, we see it in our days. The self hating Jewish anti-Semite. The Jew who fights his own people, who joins with the enemy of Jerusalem in battle against Jerusalem. ...There is a red line in Judaism that cannot be crossed without becoming a traitor to and enemy of the Jewish people. There is a limit that, once reached and violated marks one as a moser and informer and a rodef, a pursuer of Jews, who is plotting to destroy them. That line and limit is the joining together , openly and eagerly and without shame with the enemy who wishes to harm and destroy Jews. MZ, move to Israel or just shut up! This thread will be devoted to all those trolls who think MZ should stop expressing his "crazy Zionist views" unless he moves to Israel. All comments that pertain to this topic will be transferred to this receptacle. MK Eldad: Up yours, Ehud. Time to resettle Gaza! One of MZ's favorite MK's, Dr. Aryeh Eldad, is proposing to have Olmert's evil ban lifted and allow Gaza to once again be resettled by the Jews. MZ did a special interview with Dr. Eldad back in March, and would like to give yet another round of applause to him for his courage in the face of rampant, self-loathing liberalism. (IsraelNN.com) National Union MK proposes legislation to revoke the Disengagement Law and enable the government to renew Jewish settlement in northern Shomron. In submitting his proposed legislation to the Knesset this week, MK Eldad explained, "Ever since the end of the expulsion, on Sept. 22, 2005, the events have proven that the entire plan, directed by then-Prime Minister Ariel Sharon, was a total failure. Israel's international standing has deteriorated, and Palestinian terrorism against Israeli citizens has intensified." "Non-stop Kassam rockets and the kidnapping of the soldier Gilad Shalit are just some of the results of the sense of victory [in the Palestinian Authority]," Eldad said, "in the wake of Israel's flight from Gaza. Thousands of Israeli citizens who were sent to settle these areas by Israeli governments found themselves uprooted in their own country, with no permanent home, source of sustenance, or clear future." Eldad said that the clauses of the law that forbid entry into Gush Katif and northern Shomron, and that stipulate punishments for these acts, should be abolished: "They were designed only to prevent the Disengagement from being carried out, and to protect the safety of those who might enter these areas - but these considerations are no longer relevant. In Gaza, the Disengagement has already been carried out, and in northern Shomron, the area remains under Israeli control." In conclusion, Eldad explains, "In light of the political developments that have taken place of late, and in light of the change in the public perception, which is now that the expulsion/withdrawal was a grave historic error, it is appropriate that the Knesset approve this bill as a first remedial step, leading to the resettlement of Jews in northern Shomron." He will of course be rejected overwhelmingly by the Hellenizers, but you just gotta love his moxie. WTF is Paris Hilton doing in the Jerusalem Post? This is truly a sign that the End of Days is coming sooner when we think. Jerusalem Post - Paris Hilton was doing well after spending her first night in solitary confinement at a Los Angeles County jail, her lawyer said. "She's using this time to reflect on her life, to see what she can do to make the world better and hopefully, in my opinion, to change the attitudes that exist about her among many people," attorney Richard A. Hutton told reporters Monday after visiting Hilton. The 26-year-old hotel heiress checked into the Century Regional Detention Facility in suburban Los Angeles just after 11:30 p.m. Sunday (0630 GMT Monday) to serve 23 days for violating probation in an alcohol-related reckless driving case. Hilton surrendered after a surprise appearance earlier that day at the MTV Movie Awards, where she worked the red carpet in a strapless designer gown. This is news in Israel? The Jewish State is reporting on how PARIS HILTON is handling her night in jail? This matters? When Sharon and Olmert led the charge to forcibly expel the nearly 10,000 innocent Jewish civilians from their Gaza homes, they did so because they insisted it would make Israel safer while promoting good will with the vile islamic vermin. (IsraelNN.com) The “Swords of Truth”, an Islamist vice squad responsible for bombing dozens of internet cafes, music shops, pool halls and at least two restaurants in Gaza, has now turned its attention to female TV broadcasters. The group warned in a statement e-mailed to worldwide media Friday that it would behead female TV broadcasters in the Palestinian Authority who do not dress in strict accordance with religious Islamic standards. Female TV broadcasters in many Muslim countries wear headscarves and modest clothing. In some Arab countries, women are not allowed to broadcast at all. Unfortunately, Mr. Olmert had been dining on caviar and champagne with charming foreign dignitaries and friends from Peace Now while the moslems were bombing Sderot and declaring all women on Gaza TV not dressed in Hijab would be beheaded. No matter, soon enough these same measures will be taken by the government of Israel in order to avoid offending moslem sensibilities.